(TB30DPD) GeoCoins.net Trackable Token Geocoin - Todie's Wild Ride II: Live to ride! 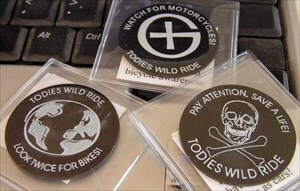 Todie's Wild Ride II: Live to ride! Use TB30DPD to reference this item. Gallery Images related to Todie's Wild Ride II: Live to ride! A cache containing your trackable item has been archived. The trackable's last known location was the geocache GC1WRF4 (http://coord.info/GC1WRF4). You may be able to determine more about the cache and your trackable item’s status by reading the most recent logs on the cache page. If you cannot determine the current location of your trackable item, you should mark it ‘missing’ on its reference page. Grabbing to drop in Ohio. Happy travels!